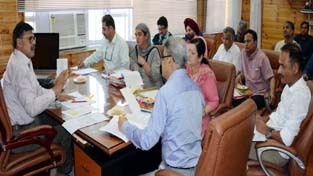 Advisor K Vijay Kumar chairing a meeting of Health and Medical Education Department on Wednesday. 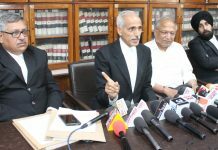 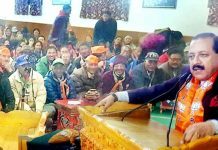 Previous articleGovernor S P Malik chairing SAC meeting on Wednesday. 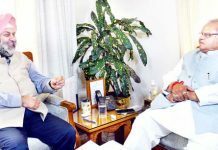 Next articlePrincipal Secretary, Finance, Navin Kumar Choudhary and Chairman & CEO, J&K Bank, Parvez Ahmad, signing MoU at Srinagar on Wednesday. 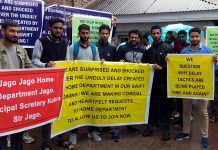 Selected SIs protesting on Wednesday. 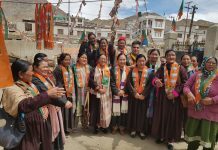 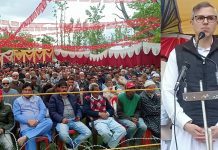 Ravinder Raina, State President BJP, during inauguration of party’s Mahila Morcha campaign in Leh on Wednesday. 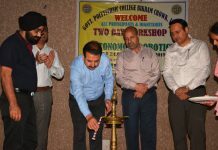 Director Technical Education lighting ceremonial lamp during inaugural of two-day workshop at Govt Polytechnic Jammu on Wednesday. 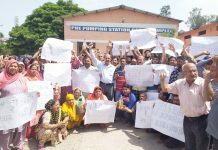 Residents of Bahu Fort staging protest at Boria Pumping Station in Gorkha Nagar, Jammu. 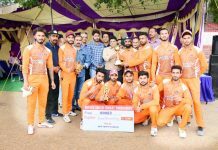 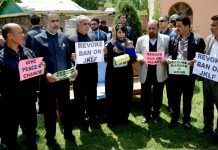 Jubilant Horizon Club players posing for a group photograph along with Commissioner/Secretary YS & Sports, Sarmad Hafeez and other dignitaries in Jammu. 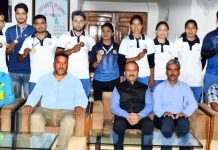 Medal winners of Pencak Silat Championship posing along with dignitaries and officials at JU in Jammu on Wednesday. 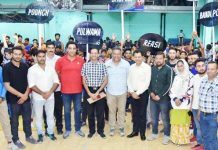 Players posing along with dignitaries, officials and organisers during inaugural ceremony of Wushu Championship in Jammu.